Although the QuickSync tool automatically discovers all your iTunes music, artwork and playlist, there are certain instances where CasaTunes is unable to find the artwork for an album. 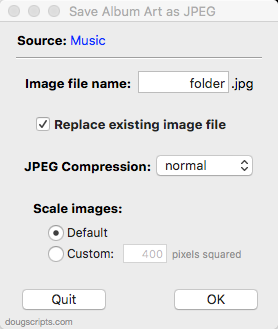 To fix this, you can run an AppleScript script to extract the album cover art from iTunes and copy it to a file in the album folder (typically named folder.jpg). CasaTunes will then discover the newly extracted album artwork on the next sync. Step 2 - Select Download. If you are going to be periodically extracting artwork, then you will probably want to purchase the script, otherwise, you can use it for free for 10 days.